The Cry It Out (CIO) method of attempting to teach babies to self soothe was once the norm. I remember calling my mother when babysitting an infant who was inconsolable, and her advice was “sometimes babies just need to cry”. She gave the same advice to my spouse after my daughter was born, which I quickly advised against. 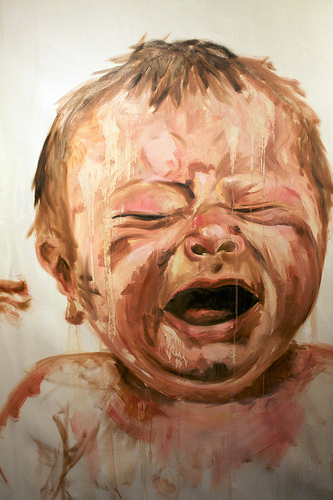 A crying baby is very unnerving. It is meant to be. Although I practice attachment parenting, I have to admit I tried CIO once. I lasted about 90 seconds. I just couldn’t let me baby cry. It felt wrong. Now research supports these maternal instincts. With neuroscience, we can confirm what our ancestors took for granted—that letting babies cry is a practice that damages children and their relational capacities in many ways for the long term. We know now that letting babies cry is a good way to make a less intelligent, less healthy but more anxious, uncooperative and alienated person who can pass the same or worse traits on to the next generation. Caregiver sensitivity may be harmed. Caregiver responsiveness to the needs of the child is related to most if not all positive child outcomes. This isn’t exactly new information. We reported on it almost two years ago in a post called Cry-It-Out: “Toxic” For Babies’ Brains. To see the information so well-referenced, as presented by Dr. Narvaez and in a publication like Psychology Today will hopefully educated and end this barbaric practice. I don’t blame my mother for her advice, and I imagine she used CIO with me. Parenting is hard; we do the best we can. Parenting has evolved or maybe revolved back to nurturing, attachment practices found in primitive and animal societies. You can’t help but wonder if some of society’s problems today find their origin in CIO. They didn’t need to do a study on this…isn’t it self-evident that letting the baby cry will do damage to his trust and security? My gosh, it’s all common sense…it’s called sacrifice….sometimes parents need to get out from under the warm cozy blankets and soothe their child!